Mike Nevin reflects on a intense and gruelling 90 minutes against the Champions on Sunday. I’ve been a bit worried about this one all week. Watching City – and in particular Leroy Sane – against Hoffenheim in midweek reminded me of their quality on the ball and incisive passing triangles. The Saturday night rumour is that maybe Jurgen Klopp has his concerns too and Trent Alexander-Arnold misses out with Joe Gomez shifted to full-back. It turns out to be true; one peculiarity of the Liverpool internet gibberish is that one exclusive fans’ forum still has access to an Anfield mole. It seems mad that a small number of Liverpudlians might have a superior insight on the Reds’ selection plans than Pep Guardiola. City also seem worried they’re going to get attacked again on the way to the ground and have reputedly installed a plethora of HD cameras on their team bus to capture the deeds of any dastardly Scouse ambushers. So intent are City on erasing the memories of their previous two visits here, that they show up dressed in an unfamiliar dark away strip. They have eschewed their traditional light blue for no reason other than we might not recognise them from the supine cast who were startled into conceding seven goals here earlier this year. Whatever the psychology of City’s disguise it’s a shame for colour of the spectacle, on a drab Merseyside afternoon, when the Reds line up against a big rival in such alien garb. The first thing I notice is that Sane isn’t playing and Gomez instead has Riyad Mahrez to contend with; another magical left foot but not quite the same slippery opponent. The atmosphere is feisty to begin with and Liverpool are penning the visitors back in the opening stages. 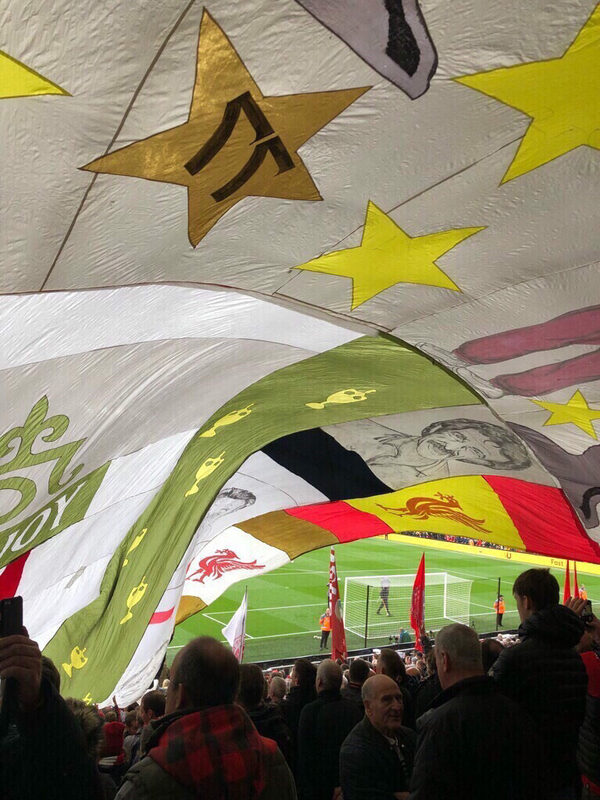 The Kop belts out an impeccable chorus of “Poor Scouser Tommy”, a classic football song which combines the history of Liverpool soldiers in the Boer War with supporting a football team. It’s a chant which has survived the ages; learning the words and its clapping rhythms still a playground right of passage. City are intent on spoiling as the first half wears on without any incident of note. The game is littered with stoppages not helped by an overly fussy referee. Martin Atkinson is one of those officials who refuses to be intimidated by the Anfield crowd and leans the other way awarding foul after foul, allowing City to chance to break up Liverpool’s early rhythm. The home fans begin to get tetchy; the patrons of the traditionally caustic Kenny Dalglish stand up in arms and gesticulating wildly at whoever is in earshot near the touchline. Guardiola, on the opposite flank, is on his feet constantly reassuring his lads they’re weathering the storm they dread. In the second half, the City supporters – themselves growing in confidence – begin to make themselves heard at the far end. They’re a strange bunch; despite their recent successes, still struggling with a nouveau riche identity after years in the wilderness. When they pipe up, they mock Liverpool’s loss in Kiev instead of celebrating their own status. The Kop responds by asking where their European Cups are. The trading of insults is a sign that game hasn’t captured the imagination. Watching matches like these with so much at stake is like a living purgatory. In what other leisure pursuit is living on your nerves, constantly fearing the worst something to enjoy? A thunderous tackle by the much-maligned Dejan Lovren releases the tension and provides the home crowd with an adrenalin shot. Still though, Liverpool are toiling. In midfield, Jordan Henderson and Gini Wijnaldum are doing manful jobs covering the City threat but Naby Keita – on for James Milner – fails to provide any thrust through the middle. The Kop yearns for this lad to be the exciting turbo-charged player we were sold by the manager but for the moment at least he’s treading water. Both teams look relatively content to take a share of the points as the clock ticks down. Then, Sane – on as sub – provides a rare surge of quality down the left. From the back of the Kop it looks like Virgil Van Dijk shepherds the danger away as the ball rolls behind the Anfield Road goal. When the ref points to the spot, it’s a genuine shock and a terrible sinking feeling as defeat now stares us in the face. Mahrez is intent on taking the penalty. For a moment or two, it’s like awaiting your fate on the gallows, with a just a vain prayer for a dodgy executioner. Inexplicably, Mahrez blazes against the top of the bar and we’re reprieved. It’s pure relief and the final whistle a few minutes later comes as something of a relief after an exhausting afternoon’s watching. At the end, Klopp and Henderson share a prolonged hug on the pitch; the boss and captain perhaps revealing their own contentment at a hard-earned point. We remain unbeaten; still vying with City and Chelsea for leadership. We’re in good shape but need to start firing soon. Eight down but still thirty to go in a long campaign; this was never a decider in a title war of attrition but we dodged a late bullet here.